Are you facing with the necessity to purchase another computer to meet all computing needs of your family? 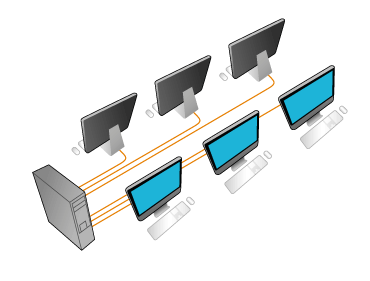 Rather than buying a separate computer for each member of your family, think about sharing your PC capacity between several users that can work simultaneously. IBIK company is here to offer you powerful ASTER software designed to share 1 PC for two users and help you cut down your computerization costs. In essence, ASTER is a shared computer access software solution that allows home users to run two monitors on a single PC system and in such a way to obtain a second computerized workplace with minimal expenses. While sharing your PC for two users, you can rely on the highest level of productivity and more freedom to work with own computer projects. All you need to share 1 PC between two users is an extra video card, mouse, keyboard and monitor (or a TV set). Advanced ASTER software enhances your PC potential and guarantees stable operation with a standard set of software, graphic applications and even games. Moreover, while sharing your PC with other users, it's possible to play net games together, work with the same programs simultaneously or do absolutely independent tasks. As a home user with only one computer available, you will definitely note all the benefits of running two monitors with one PC! Reduced hardware costs, saved electric power, a lesser dose of harmful radiation are just a few of indisputable advantages of sharing your PC resources. If you have not made up your mind yet to purchase our product and share 1 PC for two users, you are able to download a free trial version and test all powerful features of ASTER before purchase.